The chief engineer of a Panama Canal project unwittingly becomes immersed in political conspiracy and implicated in murder in this debut thriller. The chance to work on expanding the Panama Canal is an amazing opportunity for British geomatic engineer Max Burns. It comes courtesy of childhood friend Godfredo, whose father is Francisco “Paco” Roco. Paco’s CISCO Construction represents Britain in the bidding for the project. Max is wary of Paco, who physically abuses his son. Meanwhile, Max’s hydrogeologist colleague Alexandra Wong quickly tires of endless parties and prostitutes in Panama as the British group preps its design for the bid. The bidding war soon entails illicit deeds from Paco and the U.S. engineering consortium, each trying to undercut the other. Even after CISCO wins and Max becomes chief engineer, tensions remain high. A U.S. agency believes someone newly associated with Max is a particular country’s attempt to sabotage the project and threaten America’s national security. Max is in a precarious spot, now a scapegoat for both CISCO’s dire financial state and something much worse: a project-related murder. He turns to Karis Deen, biologist at the Smithsonian Tropical Research Institute (and romantic interest), for help, but she’s been keeping a rather sizable secret from Max. Martin’s novel is a smart, rousing story condensed into a relatively quick read with short and sprightly scenes and chapters. Much of the suspense is relegated to the final act; the author uses the preceding pages to focus on what Karis has been hiding. It’s worth the wait, though, with the protagonist in peril and a prime candidate for a murder frame-up, all part of someone’s political coverup. Max’s naiveté (staying with the project despite warning signs, like Godfredo not showing up for meetings), coupled with losing his parents years ago in a helicopter crash, earns him sympathy. But it also makes him less intriguing than some of the other characters, especially Godfredo, who’s torn between loyalty to his father and his unmistakable hatred of the man. 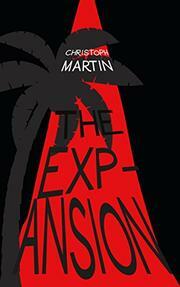 An intelligent, energetic tale rife with double-crossings and espionage.